Let’s be real, there’s not a day that goes by that we’re NOT confronted by some form of blogger, or social media, cliche on our Insta feeds. From pastel pink London cafes to those straw baskets everyone seems to be dangling from their arms right now (guilty). However…as annoying as it can be when everyone seems to look the same (or be doing the same things) there are some Instagram cliches that I simply cannot resist taking part in because, well, they do make damn good photos and hey, I’m just not that original  Of course, the majority of my blog and Instagram imagery does come entirely from my own sense of style, but sometimes I do like to play into the cliches for content that I just know will go down well and that I enjoy creating too. My god I’m a sucker for a pretty outfit in front of an extravagant floral display, and every time I see flowers spilling out of a cafe, or shop, front I just have to try to get a photo in front of them! 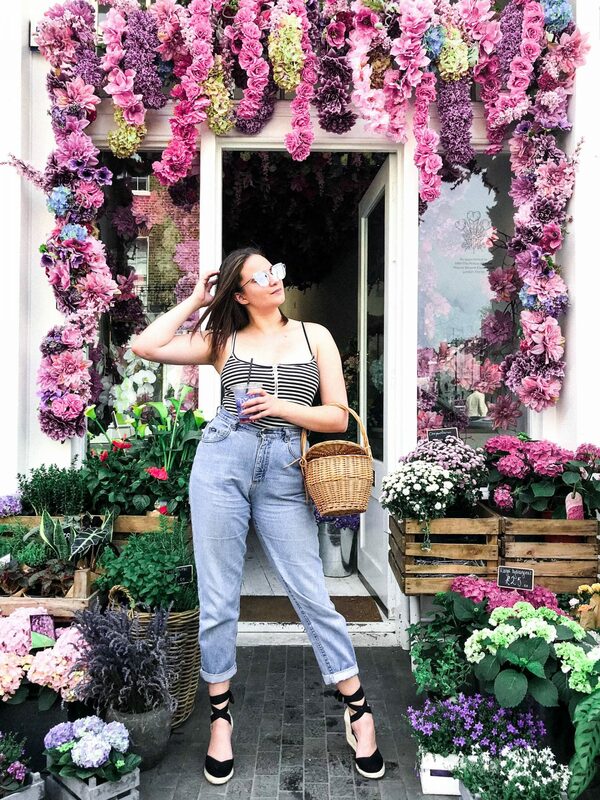 From Peggy Porschen’s cafe front to Liberty’s florist, there are some iconic floral photo spots in London, and although they are a bit overused, I can’t help but play into the Instagram cliche. I try to find floral spots that others haven’t used as much to keep my feed from looking too similar to others, but damnit there’s only so many floral displays a gal can take photos by. Everyone and their Nan (quite literally) has one of these, right? Well, that hasn’t stopped me from proudly sporting mine on my weekend outings in London! 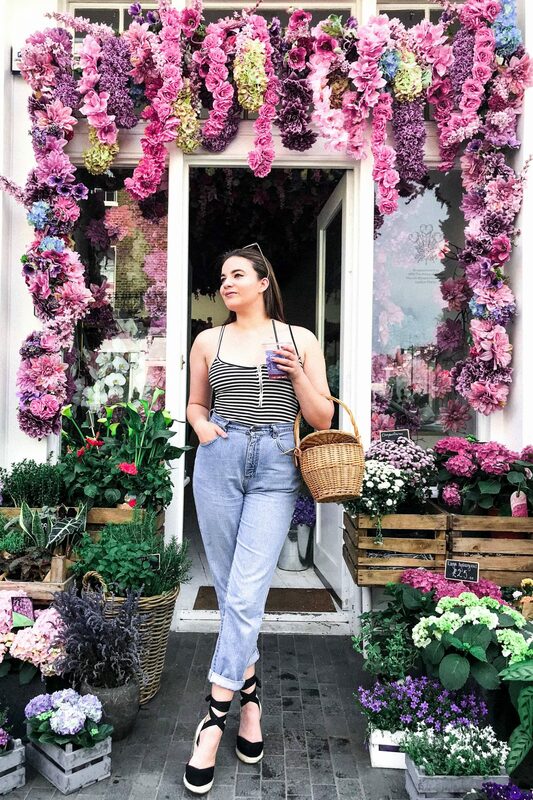 I fell in love with straw baskets when I first spied one on my Insta feed last summer and since then I’ve been on a bit of a mission to own one. Now I do, I’m swinging it around in practically every outfit photo session I can. They’re not the most practical, but the are VERY cute and I am proud to own one (and slather photos of it all over the ‘gram). Come on, own up, who invented these expensive b*stards?! Yes, they look pretty in photos, but I have to admit the majority of them taste like dishwater and every time I order one for a pretty photo, I have an 80% chance of having to force myself to get it down my throat (it can be very Bush Tucker trial-esque). And yet…I still keep ordering them because damnit I love a pop of pink in my photos and, well, I guess they’re juuust about palatable?! 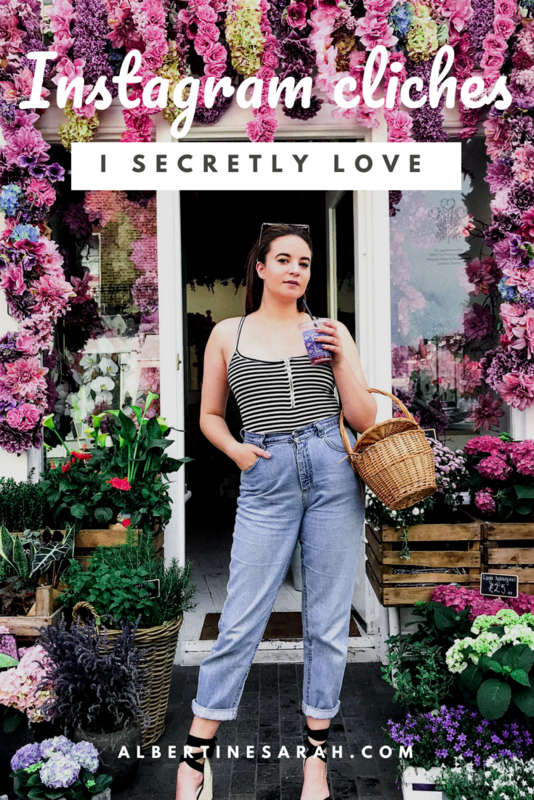 Again, this is something I spied on multiple people on Insta before quickly realising ‘OMG, it’s a blogger trend, I should probably jump on that’. I love lemon and orange prints, I think they’re cute and fun and wearing them just makes me feel happy. So yes, I did frantically search ASOS for ‘lemon print’ and order myself a dress that is quite a few Instagram cliches in one (it’s frilled, it’s off-the-shoulder, it’s a ditsy lemon print). And yes, I did post photos of myself prancing around London in it ASAP. BUT, I frigging love it, and therefore I’m kind of glad it’s everywhere. There’s a surprising amount of these in London, especially if you know where to look for them. And yes, they are irresistible when it comes to taking a beaut photo for the ‘gram. This is a cliche I dip into every now and then. I try to switch up my backdrops for photos as much as I can but goddamnit sometimes you just wanna twirl in a pretty dress in front of a row of pastel houses. Enjoyed this post? Why not pin it to your blogging/social media boards? "Building a better relationship with my body"
"Glow in liquid, cream and baked form"